← My Suggestions for Children’s books ages 7-10. 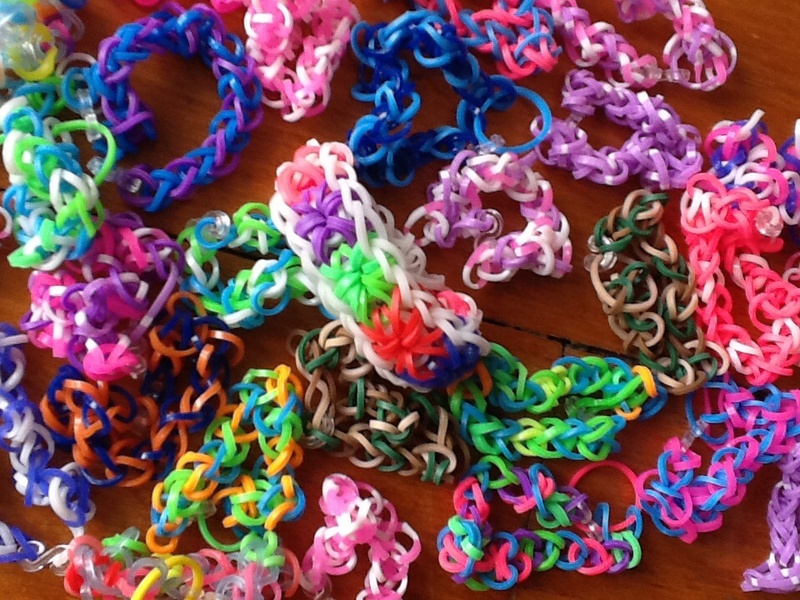 Loom Bands: Last fortnight I shared how we were aiming to make at least 100 loom band bracelets for a friend of a friend to take to Myanmar (Burma) with her. We have now exceeded the 100 bracelet mark and am aiming for at least 300. This lady, Ruth, is a short term missionary. She goes every January and takes a team of people with her. They visit orphanages and the slum areas and help out as needed. They like to take small trinkets or lollipops with them to give to each child and she discovered the loom bracelets which would be valued as a possession for these children who have virtually nothing. 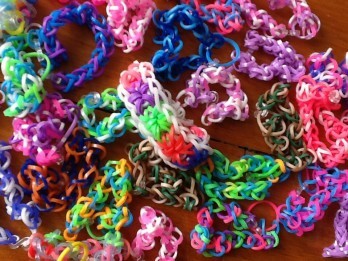 Ruth is requiring at least 600 loom bracelets. If anyone would like to assist us in this project, we would love for you to join us. You can email me at ‘[email protected] and I will give you our postal address to send them to. We need them by December 1st please. Chores: Last week, Matey offered to wash the car to help out hubby. The previous week, hubby had showed both Matey and Princess how to wash the car by hand. Whilst Matey was doing this, a man came to deliver a package. 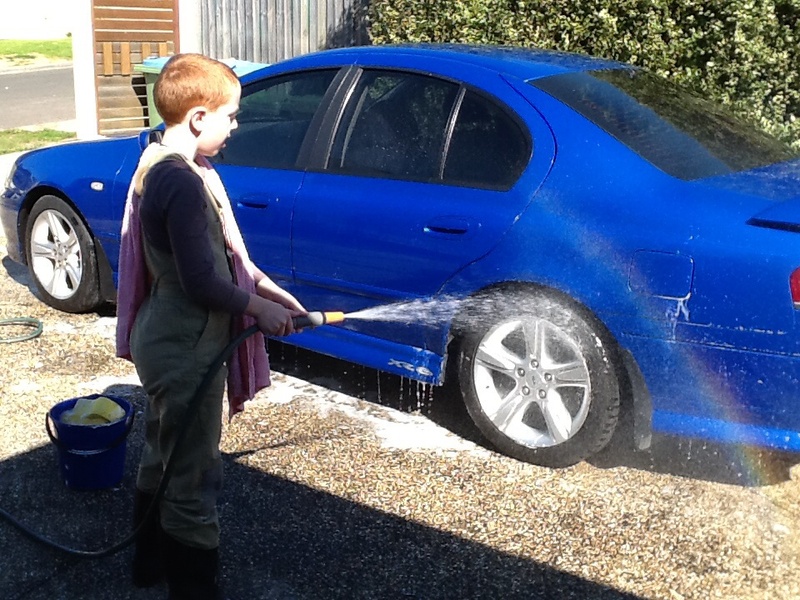 On seeing Matey washing the car, he commented how someone must want some pocket money. I didn’t understand what he was meaning to begin with, but then it dawned on me that most kids earn extra pocket money by doing extra chores. In our home, we don’t give money for chores. Doing chores is expected of everyone in our household, no matter what age. We don’t expect the same level from everyone but we do expect everyone to contribute to running the household. Hubby and I don’t get paid to cook, clean etc so why should our children. Matey offered to wash the car as it was something he could do. Meanwhile Princess cleaned out 2 of the kitchen cupboards thoroughly for me and then cooked up a great batch of scones. Great life skills. Matey and Princess also experimented with whipping cream. I got them to whip the cream until it went too far, so that they would hopefully be able to recognise when it was properly whipped in the future without going too far. It was worth letting them wasted a third of a carton of cream to see the results. 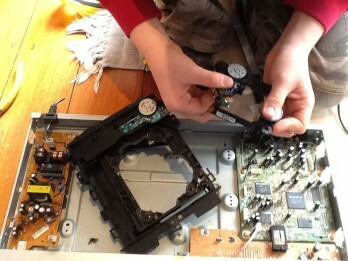 DVD player: Our DVD player broke last week so I allowed Matey to unscrew it and take it apart. He spent a good afternoon pulling it undone and examining the different parts of it. I encourage you to allow your children to explore different household items when they are no longer used. It is a great way to learn how things work. After we did our research on the internet, I also took the children shopping with me to buy a new DVD player. We chatted about and compared the various DVD players, then it was their job to connect it up to the tv and get it operational. It was only a relatively small job but it still taught them to read and follow the instructions, plus giving them the satisfaction and knowledge that they can set up and operate various devices. Bike riding: Princess has been bike riding every Saturday morning with her friend. Princess is encouraging her friend in her endeavour to get selected in the ‘High Performance Vehicle’ challenge (a vehicle propelled by pedal power) for grade 6’s. They rode 32km last Saturday. Quite a feat for Princess as she is not a big fan of bike riding and the resultant sore bottom. Trampoline: The day before we went to Cambodia, Princess submitted an entry into a colouring competition. Whilst we were away, she was notified that she had won first prize which was a springfree trampoline worth nearly $1500. On relaying the news to her in Cambodia, the first thing she said was “Oh great. I’ll sell it and use the money to buy an iPad. I knew God was going to give me one.” What you need to realise is that we already had a trampoline and really didn’t need another one. Plus, earlier in the year when we would do a time of ‘soaking’ in the morning where we played some reflective music and asked God some questions and listened for His answers, there were a number of days when Princess would always get an answer from God along the lines of “He wants to give me an iPad or MacBook computer”. It reached the point where I reprimanded her and tried to get her focus off what she wanted and putting that on God. Now, here she is, with a trampoline she could sell and use the money to buy the iPad or Macbook. It was a great learning curve for her (& us) to sell it and get the money she wanted ($1385). She promptly gave Matey $85 for being a ‘great brother’ (which he then generously gave half away as he tends to always do due to his generous nature) and she banked the rest. At the moment, I have convinced her she doesn’t need the computer immediately but to wait until she enters the school system and buy an up-to-date one then. In the meantime, she can bank the money and get some interest on it. She is o’kay with that. Learning Times tables: Matey is currently learning his times tables. I believe it is so important for every child to learn their times tables. It is such an important skill that is used in so many everyday situations. I am also a great believer in learning them by rote. That doesn’t mean that we don’t play games and reinforce them in creative ways, but it does mean that they are drilled with saying their times tables over and over until they learn them off by heart. Matey is in the midst of learning his times tables and we found a good website with times tables games to print out to make it more fun. This lady also has some great ideas for learning times tables outdoors, in creative ways etc. Her website is www.suzieshomeeducationideas.blogspot.com.au. The multiplication games to print off are on her blog dated Monday 25th August 2014. Healing Rooms: our family were involved yet again with our church’s monthly healing rooms on Saturday. Matey loved welcoming people at the front desk whilst Princess prayed with a number of people and drew pictures for them. A young girl came for prayer to another team, Princess saw her and went over to her. The girl shared how she couldn’t hear Jesus. Princess took the time to share with her how to hear Jesus and the various ways He can talk to you. This greatly encouraged the young girl and she then was able to draw a picture herself of what Jesus was saying to her. Prophetic Words: Last week our church had a conference and our family were fortunate at one stage to each receive prophetic words. Matey was disappointed that his iPod didn’t record it, even though my iPhone did, as he wanted to keep playing it over and over to himself as it made him feel good. What I found interesting was that in the prophecy over Matey, seven of the usual things I pray over Matey and bless him with were mentioned that they would occur in the future. Praying for the situation in Iraq: Monday evening we received a text from our church urging us to pray immediately for the Christians in Iraq as they were in grave danger of all being beheaded in the very near future. Matey was at swimming with hubby so Princess and I prayed and then when the others arrived home, we prayed again. Matey was intrigued. The next morning, the first thing he asked was could we please put on the television and see the news to see what had happened. I had already checked the news and apparently there had been a real threat where ISIS had surrounded a village but it had suddenly dissipated. Matey’s response when I told him was, “it was because of the confusion”. Part of what we had felt to pray the previous evening was for the enemy’s plans to be confused and confusion to reign so that no-one would be harmed. This is an important step for Matey to see that he can pray for situations on the other side of the world and that there is an effect. Movies watched this fortnight: The other evening we all watched the movie “Courageous”. Even though it is rated ‘M’, we felt it was appropriate for us all to watch (Matey aged 8 & Princess aged 11). Please note, I am not advocating watching ‘M’ rated movies. It is a must see movie for every dad. It is very impacting and powerful. I would highly recommend it to every father. Now that the kids have also seen it, hubby will talk about it individually with each of them on the next date he has with them about his fathering and their perceptions of how he is doing in his fathering role. Perception is reality, especially for children. “Little Princes” by Conor Grennan (One Man’s Promise to bring home the lost children of Nepal) Trekking over Nepal whilst injured to find the families of children who had been trafficked. “Leaving Microsoft to Change the World” by John Wood (An Entrepreneur’s Odyssey to educate the world’s children) John Wood had a life changing experience and subsequently left his elite position in Microsoft to found “Rooms to Read” throughout Third World Countries.